MELVILLE, NY – Nikon Corporation is pleased to announce that a beta version of Capture NX-D will be available free of charge beginning today. 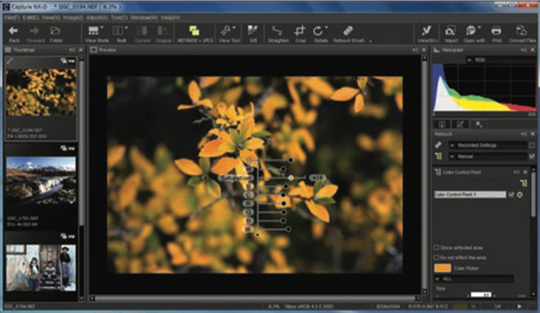 Capture NX-D is new software for processing and adjusting RAW images captured with Nikon digital cameras. Capture NX-D is a free software application that will replace the current Capture NX 2 application. RAW images (NEF or NRW file extension) captured with Nikon D-SLR cameras, Nikon 1 advanced cameras with interchangeable lenses, and Nikon COOLPIX compact digital cameras can be loaded into the application for processing and adjustment of images. In addition to RAW images, the application can also be used to adjust JPEG and TIFF files. During the period that Capture NX-D is available as a beta version, Nikon will invite users to try the software, and will collect feedback about the user experience and the application from those using it. Nikon will then use this feedback to improve the application prior to its official release. The new software will support many functions needed by professional photographers, including batch image processing, filtering and an enhanced user interface with a variety of displays and floating palettes that are ideal for multiple monitors. Additionally, photographers will also have the ability to adjust parameters including exposure and white balance in RAW files, and can adjust tone curves, brightness, and contrast, as well as functions for correcting lateral color aberration and vignetting in JPEG and TIFF files. The software also features a new “sidecar” format, which retains and saves the adjusted image as a separate file. Nikon will continue to update and provide support for the current Capture NX 2 application while the beta version of Capture NX-D is available. Once the official version of Capture NX-D is released, Capture NX 2 will no longer be supported with updates. Adjustment functions specialized for RAW processing, just as they were with the Capture NX seriesThe application includes functions for adjusting aspects of RAW images captured with a Nikon digital camera (NEF or NRW file extension) that can be adjusted even after images are captured, including white balance and exposure compensation. Smooth adjustment of images is possible immediately after they are transferred to computers. Picture Control, Nikon's exclusive function for specifying imaging characteristics, is also supported. Support for simple adjustment of JPEG and TIFF imagesIn addition to processing and adjustment of RAW images, the application offers the same functions available with Capture NX 2 for adjustment aspects such as tone curves, brightness, and contrast, as well as functions for correcting lateral color aberration caused by lenses, in JPEG and TIFF images. Floating palettes that are easy to use with multiple screensWhen two or more monitors are used, the image display area can be expanded by moving individual floating palettes for each adjustment function. Convenience has been increased with the ability to combine two or more floating palettes, which can then be moved together. A variety of displays, including comparisons of multiple images and adjustment before-and-after imagesDisplay of the application window can be adjusted for greater convenience. Thumbnail display, filmstrip display, single-image display, and full-screen display are possible. When filmstrip display is selected, thumbnails can be positioned at the top, bottom, left, or right of the image area. In addition, displays for comparing images, whether multiple image files, or a comparison of a single image before and after adjustments are applied, are available. When comparing images, enlargement of a portion of one image automatically enlarges the same portion of the other image, making the application of adjustments with simultaneous viewing of the primary subject simpler. Adoption of a sidecar format that saves original data as non-destructive filesUnlike the format previously used to save images to which adjustments have been applied, a sidecar format, which saves adjustment data as a separate file, has been adopted. Saving original data as non-destructive files allows users to start over with the adjustment of RAW images in their original, post-capture state, without undoing previous adjustments. Other functionsFiltering functions have been built into the application, allowing users to easily find the images they are looking for by filtering them according to criteria such as camera name or lens focal length based on tag data. In addition, batch processing can be used to simplify the troublesome process of applying adjustments to multiple images, and images can be transferred to another application in 16-bit TIFF format after RAW processing. M.Rahimizadeh، M.Nouri، aliii و 3 نفر دیگر تشکر می‌کنند. reza_Bahman، a.g g.a و کوروش تشکر می‌کنند. از قرار نرم افزار Capture NX-D برنامه ای غیر پولی خواهد بود که جایگزین برنامه پولی Capture NX 2 میشود ! ، در طول مدتی که نسخه Beta Capture NX-D بر قرار است ، نیکون کاربران را دعوت به استفاده از آن و انتشار نتایج استفاده شان کرده است تا با استفاده از بازخورد ها ، نسخه رسمی آنرا منتشر کند و اعلام شده تا زمانیکه نسخه رسمی عرضه نشده ، نیکون از برنامه Capture NX 2 پشتیبانی و آنرا همچنان آپدیت خواهد کرد. نمی دانم چند نفر از دوستان تا کنون موفق به دریافت نسخه Beta Capture NX-D شده اند ، من هنوز مجال کار با آنرا را نداشته ام اما با مطالعه فایل PDF هفت مگابایتی منوال این برنامه (که در سایت نیکون در دسترس هست) متوجه شدم که دیگر حرفی از U Point technology یا Control Point در آن نیست در نتیجه و به عبارتی بر خلاف قبل Nik Software مشارکتی با نیکون ، بر سر این برنامه ندارد. که امیدوارم اشتباه کرده باشم چون اگر چنین باشد تولید اجباری Capture NX-D پیامد جدا شدن از Nik Software ا است. a.g g.a و fariborz.nz تشکر می‌کنند. من نرم افزار رو نصب کردم. در مقایسه با Capture NX 2 به نظرم امکانات خیلی کمتری داره. دوستانی که این برنامه رو نصب کرده اند ، آیا بعد از نصب این برنامه روی کامپیوتر ، جایگزین Capture NX 2 میشود یا نه آنهم باقی می ماند؟! اولش فکر کردم شاید بخاطر بستن دسترسی Capture NX به اینترنت هست ، اما ربطی به اون نداشت مراحل نصب رو یکبار دیگر هم انجام دادم باز وضعیت به همین صورت است! منم همین مشکلو داشتم فایروال ویندوز را ری ست کردم برنامه فعال شد. قبلا در فایر وال دسترسی نیکون کپچر به اینترنت را بسته بودم. Anoosh-Em و hamed.asl تشکر می‌کنند. Nima Sadigh، kiavash و a.g g.a تشکر می‌کنند.